Machu Picchu in Peru offers spectacular views. If you want to see some amazing historical and beautiful sights, consider a South American getaway. Flying to South America will give you an opportunity to travel to the Southern Hemisphere. Since the region is not far from North America, the trip will seem short compared to flying to Asia or Australia. Enjoy rain forests, jungles, volcanoes, old ruins, and cathedrals. See exotic animals and lovely flora. Watch cultural dances and taste ethnic foods native to the many provinces. You may choose to visit one country and spend all your vacation time exploring it. Or, if you have more time, you may want to pick two or three countries and spend equal amounts of time in each one. Read up on each country, view photos, and plan your itinerary accordingly. A travel agent will be glad to assist you as you decide where to go and what to see. Due to the distinct dry and wet seasons, you will need to factor those in when preparing for your trip. 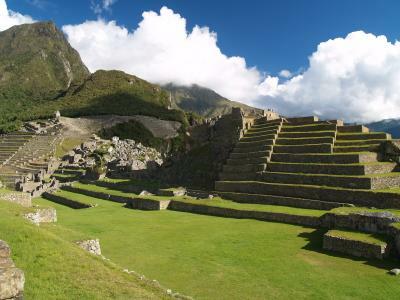 Peru - Learn the culture of the Andes Mountains and the ancient ways of the Inca Indians. Machu Picchu holds mystery and is breathtaking to explore. Take a ride in a boat down the Amazon River and even fish for piranha. Peru's peak tourist season is the dry season which is from June to August. However, if you happen to go during the rainy season, you might get wet when it downpours, but the sun comes out again quickly. Chile - Santiago, the capital, is pleasant in the months of September, October and November. Many of the country's best festivals, including Semana Musical, Fiesta de Candelario and Carnaval, are held in February. This is a good month for participating with the local people. Argentina - Visit Moreno Glacier in the city of Santa Cruz during the country's summer months (December to February). Spring and autumn are the best times to visit Buenos Aires. Cascading Iguazú Waterfalls lie in the subtropical Misiones province. Take a walk in the quaint area of Quebrada de Humahuaca and experience the old culture. Falkland Islands - To the east of Argentina lie this group of islands. Birds and mammals return to the Falklands beaches between October and March. December and January are the best months for wildlife watching here. Brazil - Considering the weather when planning a trip to Brazil. The Amazon region is one of the world's rainiest places, making travel near impossible between January and May. Visit Pantanal during the dry season. Carnaval, usually held in late February, often makes for busy streets and crowded travel. Columbia - The most pleasant time to visit Colombia is in the dry season, between December and March or July and August. Enjoy beaches, tropical rain forests, and snowcapped Andean peaks. Ecuador - Ecuador has two seasons, wet and dry. This country is known for its local festivals, which are celebrated with an abundance of fireworks, music, and dancing. Some of the biggest include the processions on the Friday before Easter, in Quito, Otavalo, and Corpus Christi. Galapagos Islands - In the Galápagos the wildlife is noteworthy. The first four months of the year are the best times for snorkeling in the warm Pacific Ocean. Bolivia - The season filled with the most tourists falls between late June and early September. Enjoy the ancient civilizations in the Andes. Visit the Parliament Building in Buenos Aires. French Guiana - The heaviest rainfall occurs in May. After this time is the best season to visit and sunbathe on the beaches. Guyana - The best time to visit Guyana is at the end of either of the two rainy seasons, in late January or late August. Visit the beautiful Kaieteur Falls. Paraguay - Paraguay's celebration of Carnaval in February is a wonderful time to visit. The best celebrations take place in the city of Asunción. The religious city of Caacupé is the most important site for Día de la Virgen (Immaculate Conception Day) in December. Suriname - Suriname's dry seasons are from early February to late April and from mid-August to early December. In March until July, several species of sea turtles come to nest at the Galibi and Wia Wia reserves. Uruguay - Uruguay's main attraction is its beaches, so most visitors arrive in the summer. Colonia del Sacramento is a special town to visit because of its cobblestone roads. Venezuela - Venezuela has a dry season (late November to early May) and a wet season which include all of the other months of the year. The dry season is more suited for traveling, particularly for hiking or other outdoor activities. Angel Falls is spectacular. Semana Santa, the week before Easter Sunday, encompasses a host of festivities, but you may need to plan ahead because the public transportation and accommodations will be full. Accommodations range from expensive to moderate and the prices you pay will depend on your style of travel. Do you want to be pampered and cared for or are you used to roughing it? Of course, the budget you have for spending on your trip will determine where you want to stay. There are pricey hotels as well as simple hostels. You may want to brush up on your Spanish before your South American getaway. All of the countries in South America have Spanish as their official language with the exception of Brazil. Brazil's main language is Portuguese. Semana Santa, or Holy Week (Easter in the US), observed in either March or April, is a festive time in Latin American countries. The whole week holds many celebrations. Families travel to visit their relatives and because of this, often roads, buses, trains, and planes are congested. Keep this in mind when you plan your South American getaway. Airfare may also cost more during this holy week.